Full review at Colorado Drama. When a story begins with a father (Reggie) digging a grave, tossing a body into it, and covering it up, while his young daughter (Sam) and her mother (Monique) are watching, you know that buried feelings will rise up to haunt the proceedings. But the deeper question, in the Denver Center Theatre Company's world premiere of playwright Donnetta Lavinia Grays' Last Night and the Night Before, is whether those involved will break the cycle of victims becoming perpetrators. There is a reason that the dominant political and socio-economic paradigm on the planet is called "the rat race," as we see in this compelling and cautionary tale from one of the hottest playwrights in the business, Branden Jacobs-Jenkins. Director Chip Walton, who also did the set design concept, has four office desks arranged in a square, separated only by clear plexiglass dividers, through which three editorial assistants and an intern gaze at one another and around which the they stalk each other, in the dog-eat-dog world of New York magazine publishing, during the 2010s. 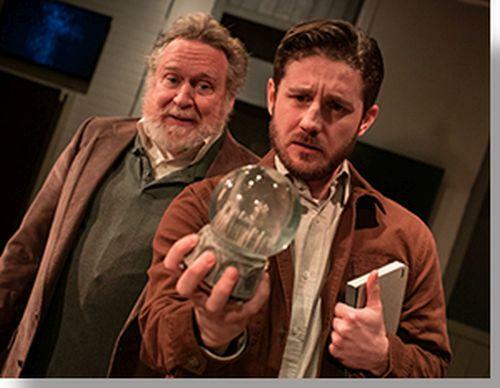 This adaptation of Leo Tolstoy's classic novel stands as the most remarkable production in the relatively new tenure of the Denver Center Theatre Company's artistic director, Chris Coleman. About nine years ago, he asked Kevin McKeon—whose adaptation of Snow Falling on Cedars impressed Coleman (who had helped with the script and later directed the production)—to consider adapting Anna Karenina, another complex and lengthy tale. Two years later, in 2012, Coleman directed the world premiere of McKeon's new script at Portland Center Stage, where he was artistic director. The week the Vinyl Vault will feature a 1984 album from violinist Jean Luc Ponty, “Open Mind.” Ponty lays down a synthesized rhythmic bed on many of the tracks to which he adds many incendiary violin solos. He’s joined on two tracks by Chick Corea and by George Benson on another. Join Geoff Anderson for the Vinyl Vault, Tuesday, July 24 at 8:30pm on KUVO Jazz.